The Super Bowl is coming up! GO TEAM GO! Our family is busy preparing for one of the most exciting times of the year and since we have a large extended family, our house is full of people coming over to watch the big game. Even though a lot of people use this day to eat foods they love without guilt, I like to create healthy Super Bowl snacks. It would be easy to just buy a bag of trail mix and dump it in a bowl, but don’t your family and friends deserve something better? If you are worried about the time it may take to prepare healthy Super Bowl snacks, I have you covered. It can be as easy as choosing popcorn over chips, salsa instead of dip, and picking leaner cuts of meat. Some of the things I like to make for people coming over to watch the game are: spiked apple cider, lean hamburgers on whole wheat buns, a variety of sandwiches and of course beer! It is also important to have plenty of healthy Super Bowl snacks. 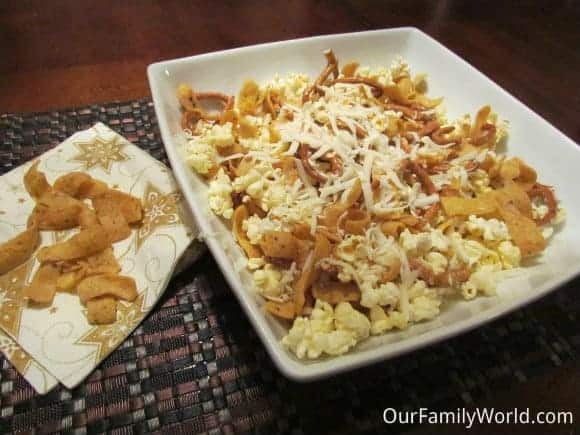 One great recipe that won’t clog your arteries is the Southwest Snack Mix. While this is not as healthy as a veggie plate, it is certainly better for your guests than bagged snacks that can be full of salt and high in calories. Don’t worry – this is one of those healthy Super Bowl snacks that is easy to make and will not take up a lot of your time. Remove all unpopped kernels from the popcorn. Put pretzels, popcorn and Bugle corn snacks in two gallon Ziploc bags. In a bowl, mix melted butter, chili powder, cumin, and garlic powder. Pour mixture into the bags. Seal bags closed and shake until the mix is coated. Sprinkle Parmesan cheese in the bags, then reseal and shake once more. Pour mix into two ungreased 13×9 inch pans. Bake for 10 minutes, then let cool. This recipe can be made ahead of time and stored in airtight containers. If you are expecting a large number of people, then double the recipe. Other healthy Super Bowl snacks you can try are these healthy crisp kale chips and this avocado hummus dip. What kind of healthy Super Bowl snacks do you make for the big game? Do you make hot wings, put out a veggie platter or make liquor chocolates? What’s It Like Not to Want Kids but to Have One Anyway? I would have never thought of adding cheese to popcorn. It tastes really good! You can add so much stuff to popcorn to make it more fun. That looks delicious! And so fun! Definitely something fun to try out! This looks great! I’ll have to whip some up for game day! Anything with popcorn is an automatic win for me. Sounds like a delicious snack the whole family will love! This would be great for our movie nights as well! Yum. Wow. 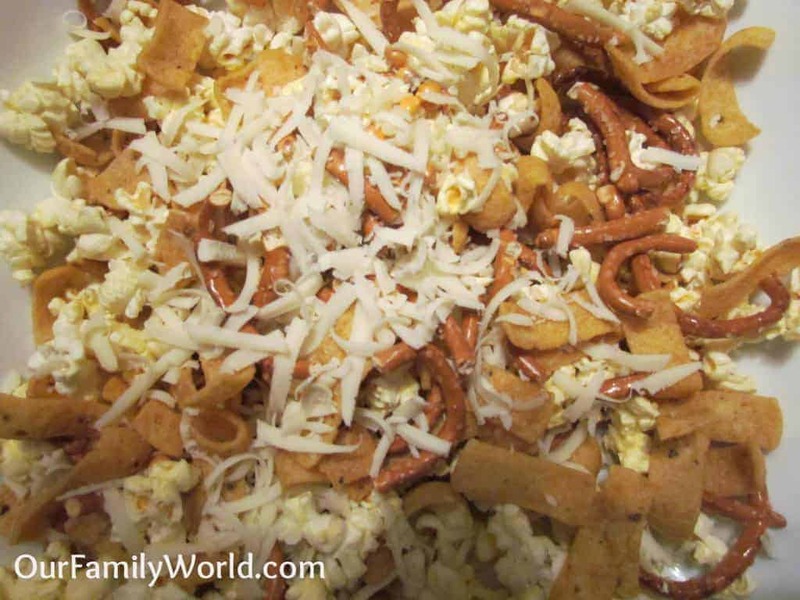 Popcorn, cheese and pretzels – 3 of my favorite things to eat!